Vancouver, BC – Skyharbour Resources Ltd. (TSX-V:SYH)(OTCQB:SYHBF) (Frankfurt:SC1P) (the “Company”) is pleased to announce it has commenced its winter 2019 diamond drilling program at its flagship 35,705 hectare Moore Uranium Project, located approx. 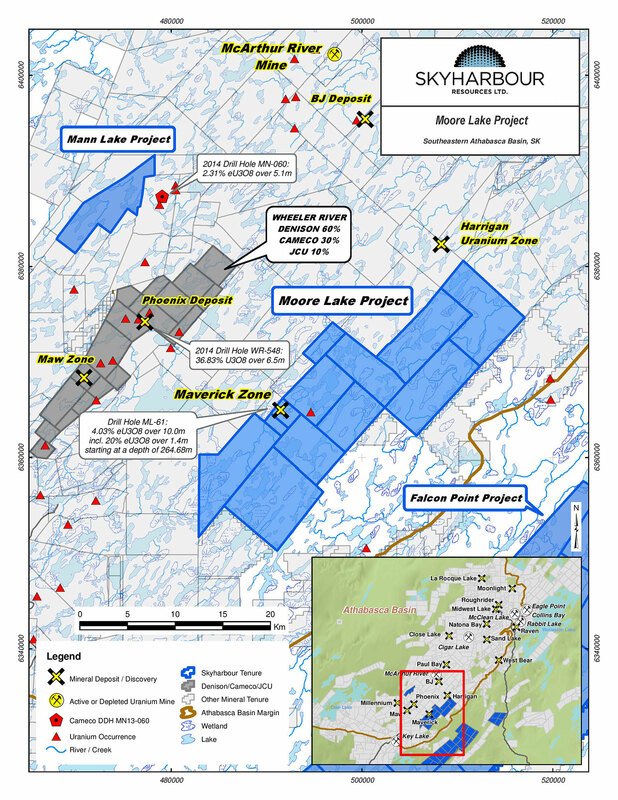 15 kilometres east of Denison Mine’s Wheeler River project and near regional infrastructure on the southeast side of the Athabasca Basin, Saskatchewan. The Company is planning to carry out a minimum of 3,000 metres of drilling in eight to ten diamond drill holes to follow up on the success of the drill programs completed last year. This drill program will test both unconformity and basement-hosted targets along the high grade Maverick structural corridor, as well as essentially untested prospective conductive corridors identified by Skyharbour’s technical team. Of particular interest are potential underlying basement feeder zones to the unconformity-hosted high grade uranium present along the Maverick corridor. These targets have seen limited historical drill testing.